to optimize the time you spend in contact with both nature and the local people, we offer true expedition conditions by incorporating yak trains, overnighting in tents and a night in a traditional tea house, giving you the widest possible range of experiences. the only operators offering expeditions up to the Mardi Himal Base Camp with an exclusive client to guide ratio of 1:4, and a client to porter ratio of 2:3. 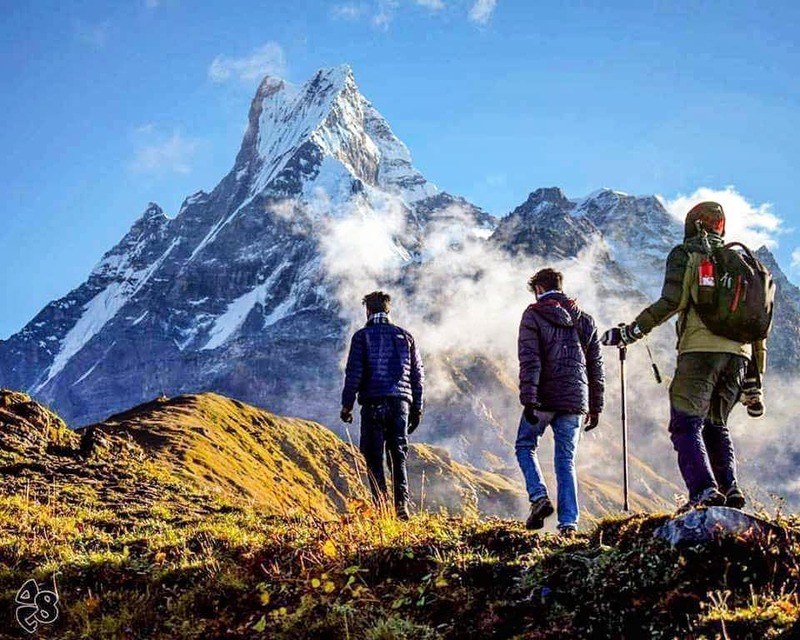 Nestled near the Annapurna’s sacrosanct Machhapuchhre the newly opened Mardi Himal Base Camp route offers the discerning traveller a true alpine expedition without the burden of crowds or the disabling effects of high altitude (max: 3,580m/11,745ft). We are the only operators offering expeditions up to the Mardi Himal Base Camp with an exclusive client to guide ratio of 1:4, and a client to porter ratio of 2:3. Furthermore, to optimise the time you spend in contact with both nature and the local people, we offer true expedition conditions by incorporating yak trains, overnighting in tents and a night in a traditional tea house, giving you the widest possible range of experiences. We also provide a cook and a mess tent to unwind in at the end of each day over sweet tea while savouring local and foreign dishes. Committed to safety and the environment we offer an alpine experience that is something other than the typical guided tour. Our fully supported all-inclusive 6-day Mardi Himal expedition is the ideal choice for those who seek an ‘off the beaten track’ adventure in a more remote part of the Annapurna range away from the crowds. And because you need not contend with the full debilitating effects of altitude, this can be an expedition enjoyed by folks and families of all ages. Join us down mystical mountain paths travelled for centuries by Nepal’s ancient people, up through enchanted rhododendron forests and above the treeline to the Himalaya’s bewildering mountain landscape that is at once mesmerising and terrifying. More than just a natural experience, you will encounter and come to unravel some of the mysteries surrounding Tibetan Buddhism as it has been practiced for centuries by these people of the Annapurna. Moved by the imposing landscape and touched by the kindness and generosity of its inhabitants, like countless others you will long to return to this magical place before you’ve even left. Day 01: Start Pokhara, drive to Phedi and trek to Deurali (2100m/6,720ft): 30 minutes drive, 4-5 hours trek. After an early morning briefing and breakfast with our Team Leader, we start our adventure with a drive to Phedi and start trekking from there. We walk on stone steps, terraced fields and through villages and forests before reaching Dhampus where we have lunch. We continue our walk to our basecamp near to Deurali which is a small village beautifully located on a ridge with good views of the Annapurna South, Mardi Himal and Macchhapuchhare. Overnight in Deurali Base Camp. 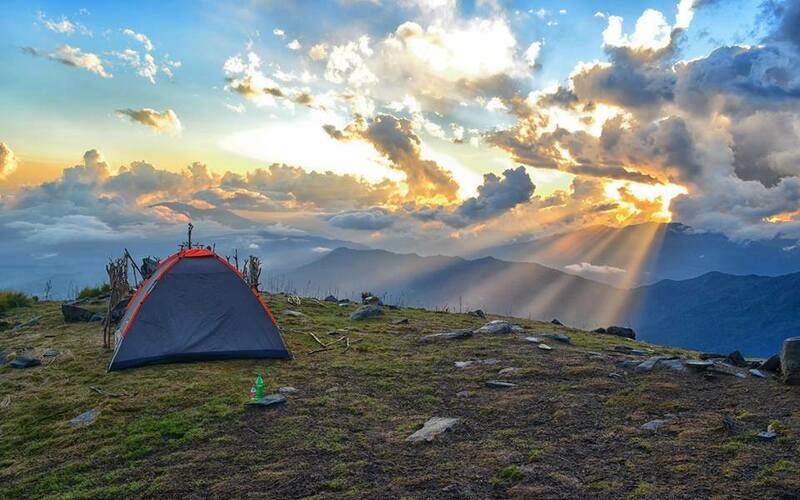 When you arrive, your tents in base camp will be ready. After a wonderful evening of socializing around the camp fire and the day breaks, one of the camp crew wakes you up with a cup of tea / coffee and a warm smile. After the tea you freshen up and head for a heartily prepared breakfast before setting off thru the forest dotted with the red rhododendrons. The flowers are a common sight in Nepalese hills and it is no surprise that its Nepal’s national flower. Our trail is very quiet until we reach a clearing off the forest camp. We can take rest and explore the area which is also known locally as Kokar. Overnight in our Forest Base Camp. Our trail passes through lush forest dotted with the red rhododendrons. The flowers are a common sight in Nepalese hills and it is no surprise that its Nepal’s national flower. Our trail is very quiet until we reach a clearing of the forest camp. We can take rest and explore the area which is also known locally as Kokar. Overnight in our Forest Base Camp. We trek uphill alongside a ridge towards Mardi Himal and Macchhapuchhre. The tree lines start getting thinner and the area mostly consists of shrubs with isolated rhododendron bushes along the trail. If lucky, we might even come across the Daphne pheasant (national bird of Nepal) on our way to high camp. We ascend up to the high camp, which the final destination of the day. From here the mountain views are stunning. Overnight in high camp. On our trek to the upper viewpoint we ascend and descend, and sometimes on a steep and narrow trail. Our trail passes through pastures and we hike along a narrow ridge before reaching the Upper Viewpoint. The view of the Himalayan vista from here is astonishing. We see Mardi Himal (5587m), Annapurna I (8091m), Annapurna south (7219m), Hiunchuli (6441m), Baraha Shikhar (Mt. Fang) (7647m), Tent Peak (5695m), Singhachuli (6501m), Machapuchhre (6993m) and others. We trek back down past the high camp for an overnight stay Mid Camp. Day 06: Mid camp to Lumre, drive to Pokhara and fly to Kathmandu: 4-6 hours trek, 2 hours drive we take a different route in high camp that takes us to Sidhing instead of going back down to Mardi Himal. The different route lets us experience something different and makes our trek exciting. Siddhing offers a quiet stay for trekkers as it is tucked away from the busier trails. We walk towards Lumre finally reaching the road from where we begin our drive to Pokhara. -Down sleeping bag, tents,mats(to be returned after trip. Tents will be setup and broken down each day your support team). 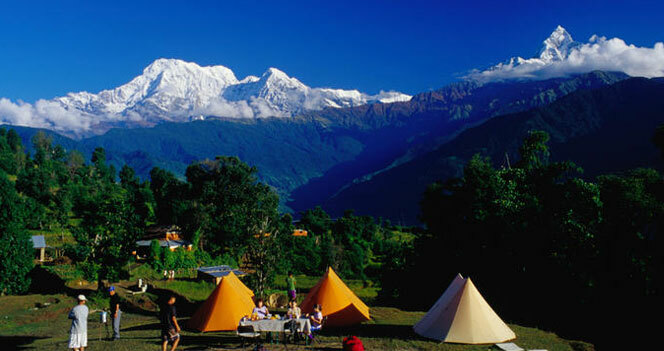 All Base camp tents for kitchen and living facilities on the mountain. All ground transportation on a comfortable private vehicle as per itinerary. An experienced, English-speaking and government-licensed Team leader and assistant trek leader (4 trekkers: 1 assistant guide. Porter service (2 trekkers: 3 porters). Mardi Himal trekking bag/duffel bag, t-shirt and trekking map are yours to take. Domestic flight from Kathamandu to Phokara and vice versa. You you will be sharing North Face Expedition tent in base camp. If you would like your own tent please let us know before hand. We also provided premium Mess Tent Facilities and Tent Bath Room Tent Facilities. We do not provide food, hotel and transportation from Kathmandu to Pokhara. Pokhara is our starting destinatation and this package give more flexablity to traverlers already in contry or have other engagments before or after the trip. If you would like us to organize a package from Kathmandu to Pokhara please Check out our Add-On’s! Meals: During our trek, we can enjoy authentic Nepalese food as well the more common international cuisine (Tibetan, Continental, Italian, Indian, etc.). Breakfast and dinner will be provided from the base camp menu where we spend the night whereas lunch will be provided on the way to the next destination. All meals, including breakfast, lunch and dinner, will be provided during trekking while only breakfast will be available at our Pokhara breifing on the morning of departure. There will also be welcome and farewell dinners. As equally existent as the risks, are the steps taken by Janet Belarmino’s Himalayan Climb to minimize and mitigate them through our professionalism and constantly increased preparation and technology. Much responsibility is taken with an expedition organizer constantly in control of all clients and team members, at all times, we ensure that hazards are constantly assessed and avoided. Our decisions and methods are supported by contingency plans that take as many aspects of the expedition into account, and we only ever use the best tried and tested equipment i.e. (UHF radios, Thuraya Satellite smartphone, advanced first aid kit). Unlike other expedition providers, Janet Belarmino’s Himalayan Climb also has a dedicated Emergency Medical Technician and certified NEBOSH Health and Safety Supervisor as part of their team. Travel insurance is a must and not an option when joining trekking, tour and mountaineering trips. Your insurance policy should include helicopter rescue flight/s, medical treatment, hospitalization and repatriation apart from the normal coverage of loss of baggage, theft, flight / trip delay, cancellation etc. We suggest you to obtain such policy in your own country before setting on your trip as we do not arrange or sell insurance. Your safety is of paramount concern while traveling with Himalayan Climb. Please note that your Team Leader carries a Sattelite phone and med kit and he/she has the authority to amend or cancel any part of the itinerary if it is deemed necessary due to safety concerns. Every effort will be made to keep to the above itinerary; however, since this adventure entails travelling in remote mountainous regions, we cannot guarantee that we will not deviate from it. Weather conditions, health condition of a group member, unexpected natural disasters, etc., can all contribute to changes in the itinerary. The leader will try to ensure that the trip runs according to plan. But please be prepared to be flexible if required. Any cancellation due to weather will be rescheduled in the next day/s. We do not refund when we re schedule. If you cancel a trip we will not remit your 25% deposit if notice given is less than 30 days before your trip is scheduled to leave. We only issue refund if we cancel the trip. We will not refund any amount if you cancel 3 days before your scheduled departure or during the trip itself. Janet Belarmino: On May 16th, 2007 at 9.03 am Nepalese-time Janet realized her dream and stood on top of the world, the summit of Mount Everest (8,851 meters / 29,035 feet) becoming a Global First for women with her team mates, Noelle and Carina accomplishing the First Women Grand Traverse of Everest from China to Nepal. After climbing Mt. Everest, Janet took on the epic and historical sailing voyage of the Balangay.